It takes a little bit of magic and a lot of skill to stretch a limited income to feed a family. Maybe skill isn’t the right word, as it isn’t a difficult task, but rather requires know-how and can-do. Our food budget is reasonably flexible however we have carried forward good habits which help keep our food spend down to a reasonable limit. Homemade yoghurt (not from a sachet), bread, baking and creating meals from scratch rather than using packet mixes and expensive snacks all help keep costs down. Jas McPhee begins her book with her story and how this book (and her Facebook page) came to be (it’s a short story, not pages of waffle). Following on is 3 pages of hints on how to shop savvy – basic ideas such as shopping in season, buying on special, buying ‘reduced to clear’ & not giving in to the kids. That last one is a kicker. Miss M is always sneaking things into the trolley while I am busy calculating whether it is cheaper to buy the 500g or the 1kg pack. We had a strategy that worked for us – we have a housework roster so each child has a week of tasks then they swap. Whoever is on Kitchen & Dining duty is allowed to choose one “treat” food item for the family from the supermarket. “Treat” is interpreted as something Mum wouldn’t normally buy. It is quite interesting what each child choose – Mr L chose a huge 5 litre container of tomato sauce as he didn’t like my homemade tomato sauce. One of them chose a box of 24 cans of Coke. We have stopped this practice (not because of the Coke) but remembering it now, it would be a good idea to instigate it once more. 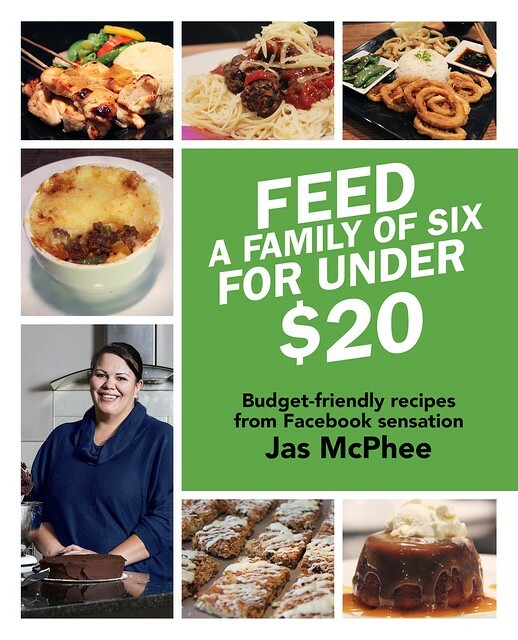 Jas includes a large list of pantry, fridge & freezer staples then goes on to share many recipes for which she has detailed the cost. Recipes such as Vietnamese Spring Rolls, Butter Chicken with Home-made Roti, Mongolian Barbecue Stir-fry & Fettuccine Seafood Marinara illustrate that budget need not mean boring. Turning to the back of the book where the best things reside, I find the delicious sounding Caramel Peanut Butter Ice Cream Pie. I couldn’t make that to feed my family – only three of the five of us adore peanut butter…..but it sure looks good. The Apple Crumble pie recipe looks a simple version with a flour, butter & sugar topping. It only comes in at $2.50 for a dessert that serves 6 – adding ice cream will help bring the cost up but not by much if it is homemade ice cream. And then there is the Raspberry Jam Slice – Mopp asked me if I could make this just last week and now I have just the recipe to try it. 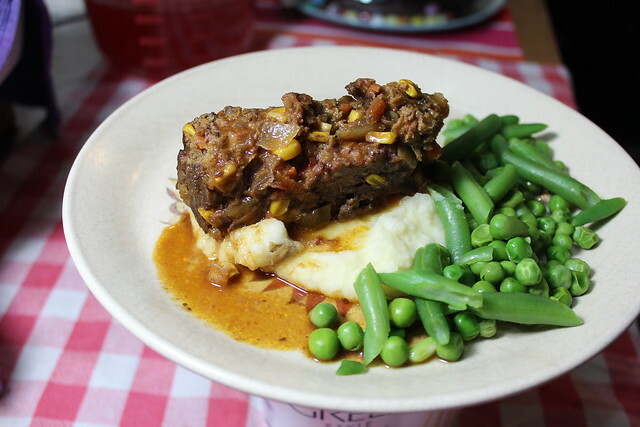 We taste tested the Old-Fashioned Meatloaf as we were hosting a combined family dinner and I needed a quick, easy, tasty tea that took little time to prepare but for which I had all (most) of the ingredients. The Anster couldn’t find my stash of mince in the chest freezer so he went out to the shop for some more and came home with about 5 kg of mince. Yep, it was on special but now I have to fossick around in the freezer to make room to store it all. No wonder we lose stuff in that freezer. So anyway, the meatloaf. 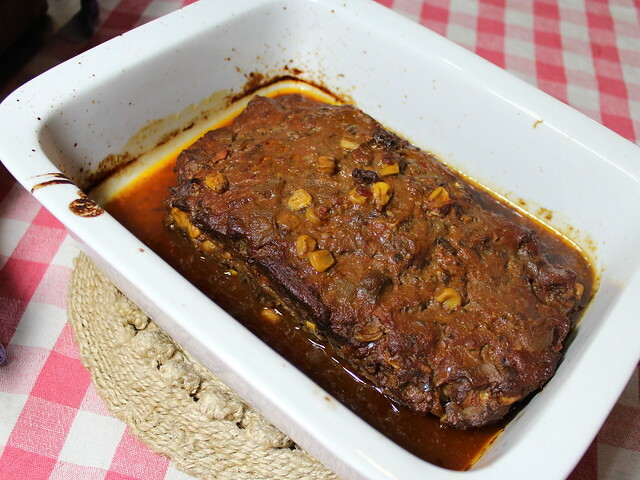 This meatloaf is as it states – an Old Fashioned Meatloaf. I have a regular Mexican meatloaf I make which our family loves. It is spicy, saucy and super tasty. My family voted for the super spicy version as opposed to the more traditional version but the traditional meatloaf was good, and I will probably make it again, but maybe with a few more tweaks here and there. Hopefully without blowing out the budget. 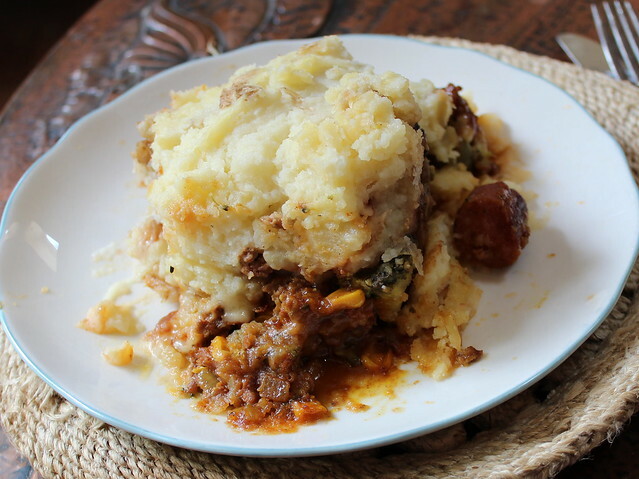 Combine all the meatloaf ingredients (put in a really big bowl and mix through with your hands, it’s the best way to get the mince & sausage meat mixed in thoroughly). Add seasoning – I added salt (about 1 tsp) and a really good grinding of black pepper (we love pepper). Place in an oven dish in a log shape (I used two large loaf pans). Combine all barbecue sauce ingredients together and pour half over the meat loaves. Bake for 20 minutes, add the rest of the sauce, and continue cooking until cooked (about 40 – 60 minutes). It’s ready when it smells cooked, but poke a knife in and check it is fully cooked to be safe). We served our meatloaf with loads of mashed potato & broccoli with cheese sauce. This quantity was to serve 10 – but we had at least half the meatloaf left over (though our guests did contribute to the meal with rice salad, field mushrooms sautéed in butter (yes, they were delicious) and a sweet/sour sausage dish. If you want a size six serving, then only put in one of the portions of mince. The meatloaf was very juicy when cooked, so I tipped off the juices into a jug. I then turned the meatloaf into a clean dish and poured some of the juices back over the meatloaf. In hind sight, the juice would have benefited from passing through the fat separator. As for the leftovers – we ate some of them for tea tonight. I broke up the meatloaf into smaller pieces, added some more of the juices (sans fat). Then stirred through the leftover broccoli & cheese sauce. Topped with mashed potato and baked until bubbling and fragrant. It was very good – kind of like meatloaf potato-topped pie. – I use premium mince where possible, but premium mince was sold out, hence half premium, half regular. – I use real sausages, not flavoured sausages (the recipe specifies sausage meat). – I used wholemeal bread (recipe just states bread). – I specified the apple variety, just because I can. Any apple would do. – I added the zucchini (it looked sad in the fridge all on its own). – I doubled the garlic (can never have too much garlic and ours is home-grown so for me, no cost increase). – red pepper pesto (I had a jar in the fridge that needed using up, otherwise would have used tomato sauce as the recipe states). – garlic & parsley mustard (another jar I had in the fridge that required using, otherwise regular seedy or Dijon would be the go). – apple cider vinegar (instead of malt – gotta get more apples in recipes). It would be interesting to do a costing of my recipe but as I got the garlic, capsicum & zucchini out of the garden, that will bring my costs down a little. The premium meat & sausage & organic apple cider vinegar will push costs back up again. This entry was posted in Book Review and tagged Budget friendly recipes, Penguin Group by Jo Dohrman. Bookmark the permalink.